The furcation is a normal anatomical region where the roots begin to diverge in a multirooted tooth. Normally, this area is sealed from the oral environment by the periodontium (gingiva, periodontal ligament, alveolar bone, cementum). Accumulation of plaque and calculus buccally often results in periodontal inflammation and infection. Extension of periodontal disease between the tooth roots directly exposes the furcation to the oral environment, resulting in attachment loss that allows food and debris to lodge in the space (Figure 1A). 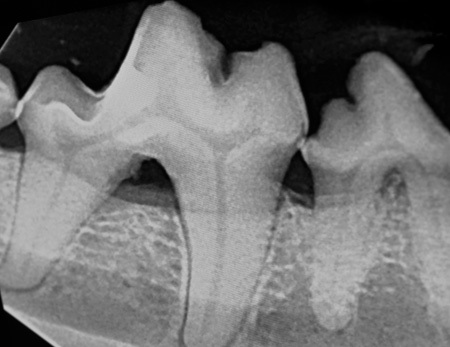 Intra-oral radiographs are helpful in diagnosing furcation invasion. Radiolucency in the furcation suggests furcation disease. The slightest radiographic change in the furcation should be investigated clinically. Interradicular (between the roots) bone loss is usually greater than it appears in the radiograph (Figure 1B). 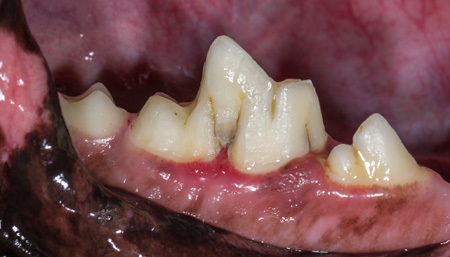 The most common cause of furcation disease is extension of periodontal infection, resulting in interradicular bone resorption and formation of a progressive defect (Figures 2A- 2C). Figure 2A. 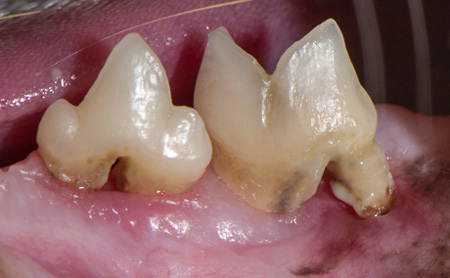 Advanced periodontal disease resulting in furcation exposure in a cat’s right mandibular first molar. Figure 2B. 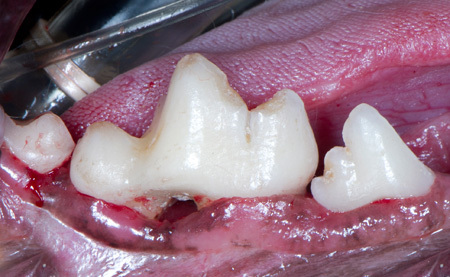 A through-and-through furcation exposure in a dog’s right first molar. Figure 2C. A radiograph of the dog in Figure 2B confirming the furcation. Congenital enamel infolding defects can also lead to furcation and endodontic disease. The resulting irregular furcation tooth surfaces do not allow for complete attachment of the periodontal ligament in the area. 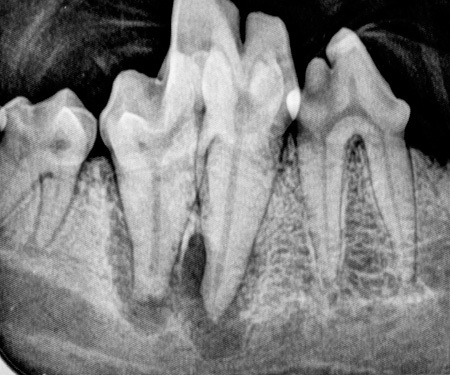 Additionally, in some of these congenital defect cases, the infolded enamel allows oral bacteria to enter the exposed root canal, leading to pulpal necrosis evidenced by periapical lucency on radiographs. 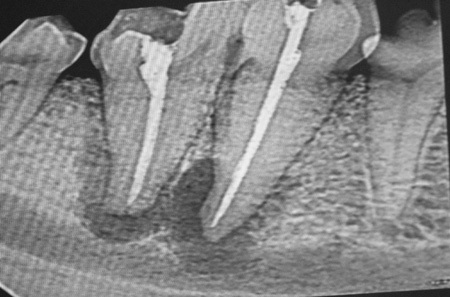 When present, root canal therapy or extraction is indicated (Figures 3A-3D). Figure 3A. 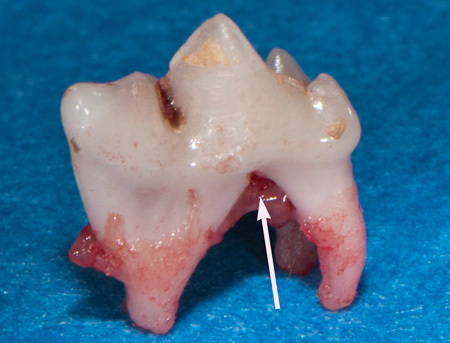 A congenital infolding enamel defect on the buccal surface of the right mandibular first molar. Figure 3B. 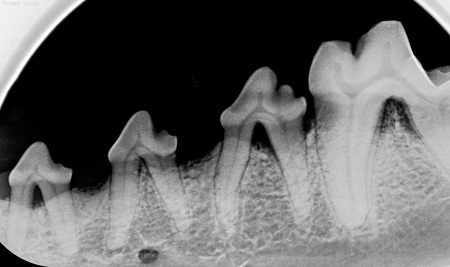 A radiograph confirming the defect and periapical lucency consistent with pulpal necrosis. Figure 3D. A follow-up radiograph four months after treatment revealing decreased periapical lucency consistent with resolving disease. 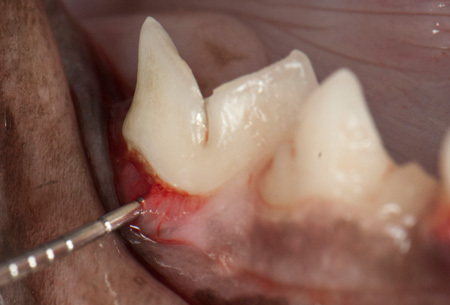 Furcation involvement stage 1 (F1) is diagnosed when a periodontal probe extends less than half way under the crown in any direction of a multirooted tooth with attachment loss. 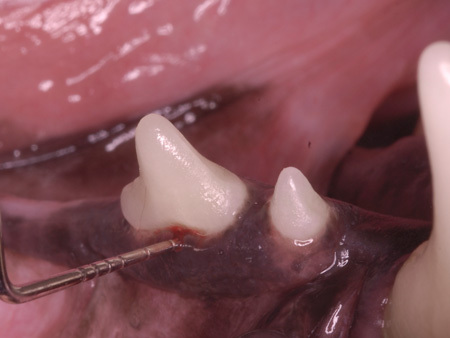 A portion of alveolar bone and periodontal ligament is intact at the furcation (Figure 4A). Figure 4A. 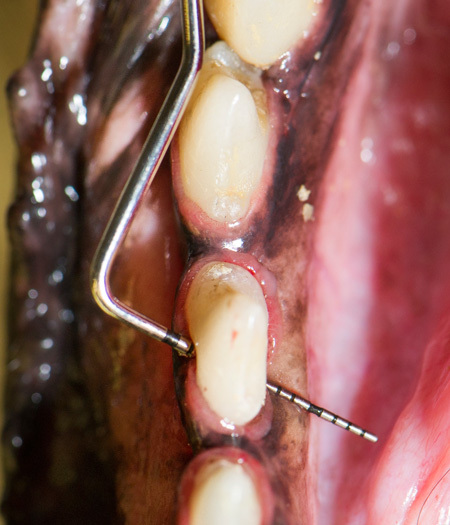 A periodontal probe extending 3 mm into the right mandibular second premolar furcation. 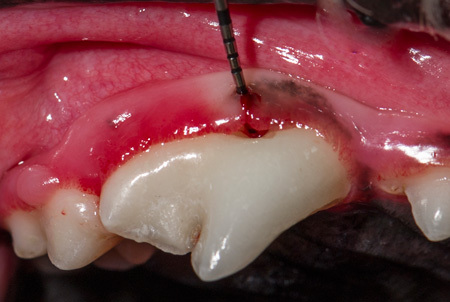 Furcation involvement stage 2 (F2) exists when a periodontal probe extends more than half way under the crown of a multirooted tooth with attachment loss but not does not exit on the other side (is not through-and-through). The undermined furcation is occluded by gingiva or bone on one side. The lesion is essentially a cul-de-sac (Figures 4B and 4C). Figure 4C. 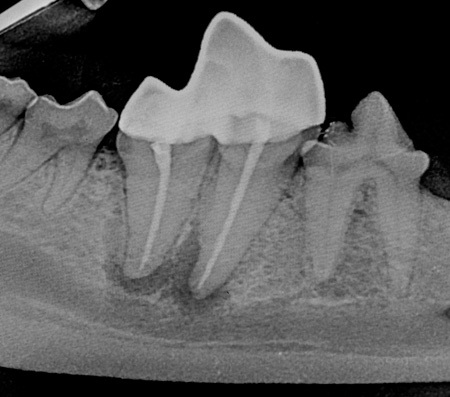 A radiograph revealing minimal lucency in the furcation area. Treatment is similar to F1 involvement with the addition of root planing and consideration of guided tissue generation using bone graft and a physical barrier to prevent epithelial migration into the furcation area. This intervention allows bone migration, differentiation and maturation in the area. Furcation exposure stage 3 (F3) exists when a periodontal probe extends under the crown of a multirooted tooth, through-and-through from one side of the furcation to the other. The periodontium is destroyed to such a degree that the furcation is open and exposed. An explorer can easily pass from side to side (Figures 4D-4F). Figures 4D and 4E. A periodontal probe extending into furcation of the right mandibular third premolar through and through. Figure 4F. 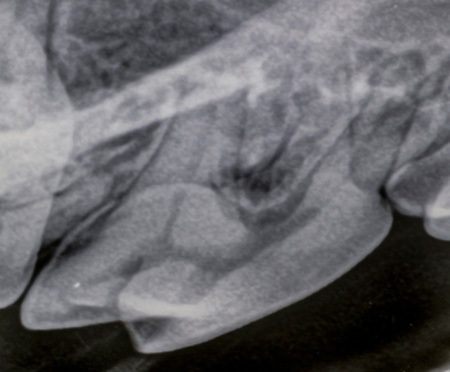 Furcation exposures in the left mandibular fourth premolar and first molar in a cat. Extraction is the treatment of choice, although advanced mucogingival surgery can be performed with a guarded prognosis. 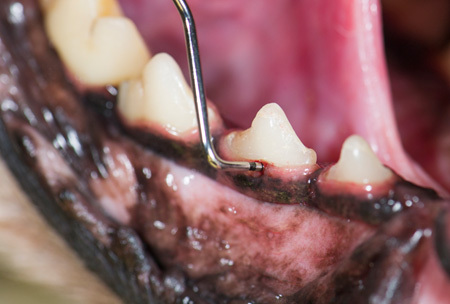 All of your canine and feline patients need to have a complete examination while anesthetized to best clean and evaluate dentition. Furcation disease is often silent and can be treated when found early to decrease the rate of progression and discomfort.